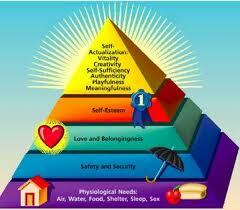 Abraham Maslow is credited for developing a chart that depicts the hierarchy of need. He suggests that one begins at the base level of need before progressing to higher levels of need. Until the base level is met, one cannot proceed to the next level. Ultimately, one moves to a point where the drive to achieve to your maximum potential becomes paramount. As I preach today from the Philippians text found in Chapter 4:19, “But my God shall supply all your need according to his riches in glory by Christ Jesus." Paul flips the Maslow chart on its head and lets us know God begins with your mission before addressing your means. In God's economy where He guides, He provides. Therefore, instead of looking for things, needs and wants; look for God's plan for your life. When you walk in God's purpose, God ensures your supply.